The I-66 Multimodal Study team has released new information gathered at earlier public meetings (see FABB summary of the Fairfax meeting held in Dec. 2011). Fact Sheet 3 is new and there's a list of public involvement comments from the December meetings. Try to create a safe bike trail into the heart of Tysons Corner from the W&OD trail. Extend the Custis Trail beyond East Falls Church. The Custis Trail needs to be completely redesigned and rebuilt. The steep slopes discourage commuter cycling. The trail should have the same gradual changes in elevation as do the highway travel lanes. A viable two-way solution to reducing traffic is to further promote the use of what is already there along I-66 - a bike path. 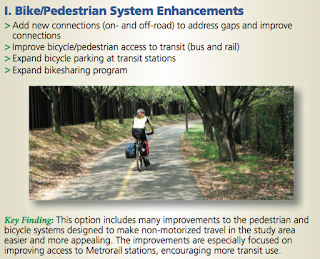 Need an improved bike/pedestrian connection from Rosslyn/Iwo Jima Memorial to Theodore Roosevelt Bridge. I don't think that the Custis needs to be completely redesigned because of slope - Arlington is hilly, and that cannot really be adjusted. What does need some attention are the blind corners. Signage/education for new commuters is so necessary - there are too many close calls as people snake down the custis too close to the line, or worse, insist on passing despite not being able to see around the bend!